Glenfiddich enriches its range of rare and prestigious Single Malts, with a new, unique expression. Brian Kinsman, Cellar Master of Glenfiddich distillery, presents the first 26 Year-Old malt released by the brand: Glenfiddich Excellence. "The fact that we are an ongoing family-owned distillery means we can do things our way, and create a luxurious Single Malt that truly lives up to its name. 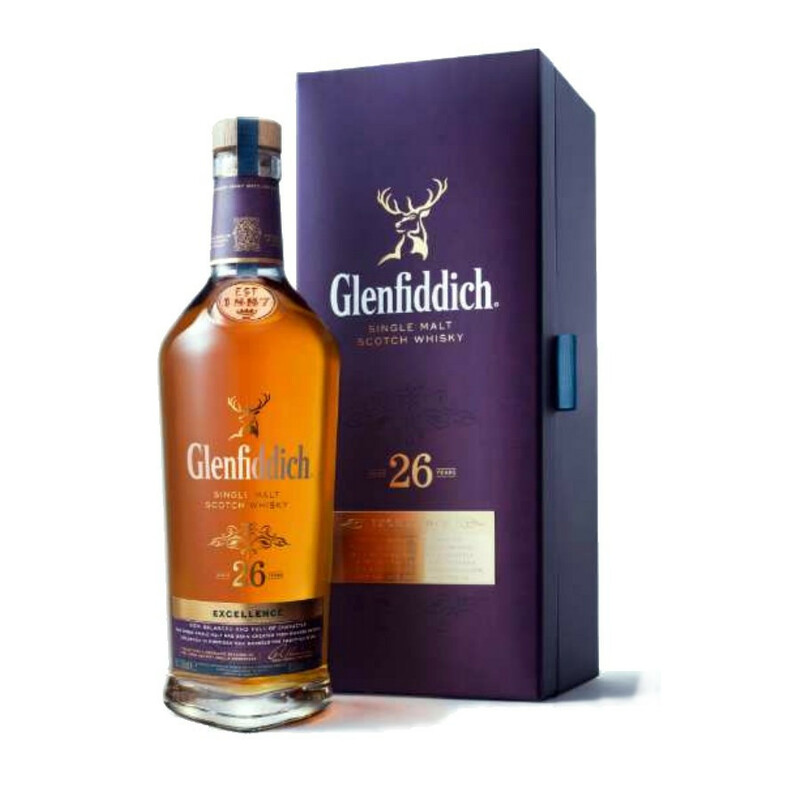 After 26 years of maturation, I am proud to bottle such an exceptional spirit". This new expression has been exclusively aged in American white oak casks. After all these years of careful maturation, we collect today an exceptionally flavoured whisky with intense vanilla notes, spicy oak, with a golden colour and delicate subtle nose, with a complex finish. This new Single Malt is naturally in line with the traditional know-how of the distillery, and ability to craft intensely fruity and floral whiskies. Presented in a classy bottle with golden details, sealed with a cork made from oak casks in which this Single Malt has aged. This bottle is packaged in a luxury violet box. This is the first time Glenfiddich exclusively use Bourbon barrels for the whole maturation process of its Single Malt. Thus, Glenfiddich Excellence 26 Years Old is certainly "one of our most delicate Single Malts, that truly lives up to its name", Brian Kinsman says. The steep-sided valley where the Fiddich River flows, gave its name to the best-selling malt in the world. The distillery is located on the banks of the river in Dufftown. Fiddich translates as “stag” from Gaelic and here’s why the animal is now the emblem of the distillery. This famous distillery has been established in 1886 and is still in the hands of the same family (as a limited company). In 1963, the company bet on spreading the Single Malt outside the borders of Scotland – which was considered as pure folly by blended scotch producers, deeming Single Malts as too intense, too richly aromatic or too complex for non-Scots drinkers. Glenfiddich remained traditional and is still heating its small stills with coal and ageing spirit in casks. The whiskies, aged in different woods, are blended in the Glenfiddich cellars, and bottled “at the chateau”! In fact, the distillery overlooks the complete bottling process. Glenfiddich is proud to own the most rewarded Single malt whisky range in the world. Nose: sweet and delicate with floral notes: spring flowers, sweet pea. Palate: richly balanced. Sweet notes of brown sugar join in lovely oak aromas, slowly rising in the palate. Subtle, spicy notes embrace flavoursome liquorice hints. Finish: long, warm and complex.